The NFL has put a freeze on its two-month-old national anthem policy, which was meant to end the controversy over protests against racial injustice, but only further inflamed the issue. The NFL Players Association filed a grievance over the policy earlier this month, saying it is inconsistent with their collective bargaining agreement and violates players’ rights. The grievance is now on hold too, and the two sides are hoping to negotiate a new agreement without heading to court. The NFL and NFLPA reflect the great values of America, which are repeatedly demonstrated by the many players doing extraordinary work in communities across our country to promote equality, fairness and justice. Our shared focus will remain on finding a solution to the anthem issue through mutual, good faith commitments, outside of litigation. This development was the result of a whirlwind news cycle that started just five hours earlier when the AP obtained a copy of the Miami Dolphins’ new team rules, which addressed “proper anthem conduct.” The NFL let teams create their own rules under the larger anthem policy, and the document suggested that the Dolphins might suspend a player protesting during the anthem for up to four games — a far longer suspension than some players received for committing domestic violence and other infractions. As Sports Illustrated explains, anthem protests were listed under a long list of “conduct detrimental to the team” as a placeholder, because any potential discipline must be published in the team’s rulebook prior to the start of preseason training. 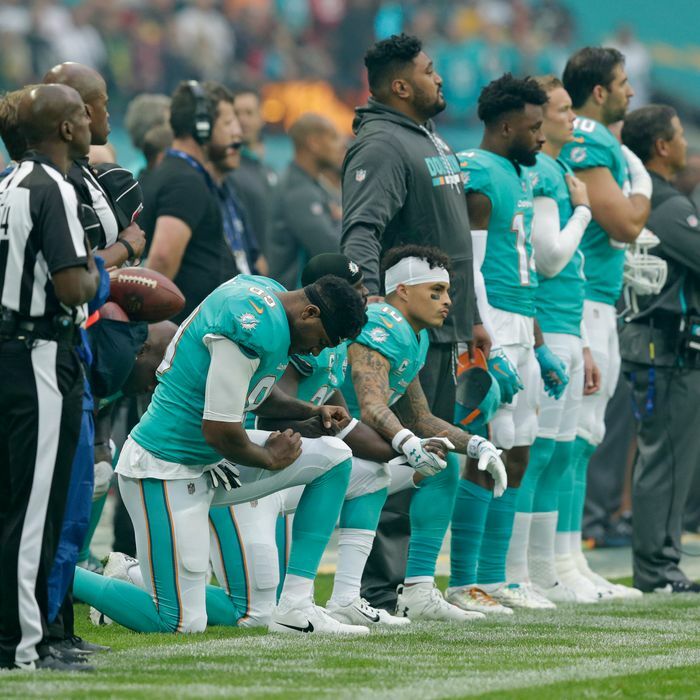 A Dolphins source said the team’s anthem rule hadn’t been finalized, and it seems unlikely that protests would receive the harshest penalty. Nevertheless, the report created an uproar, which was likely to be the first of many as other teams’ anthem policies got out. By releasing the joint statement the NFL and NFLPA were nipping the story in the bud, and giving themselves a second chance to come up with a generally acceptable rule on protests. … [Trump] not only criticized the new policy, but suggested that protesting players “maybe … shouldn’t be in the country.” A real Unifier in Chief, that one. The truth is, nothing the NFL does will ever be good enough for Trump because he knows his race-baiting and hate-mongering appeals to his base, and he’s desperate to keep them engaged. He will continue twisting heartfelt, respectful pleas for equality into disrespect for the flag, anthem, military, police, apple pie and anything else that crosses his mind that day as long as it continues to work. Indeed, this new focus on the anthem policy could not come at a better time for Trump, as he needs to shift the focus away from the mess he created in Helsinki. After all the talk of how he was weak in his interactions with Vladimir Putin, he’ll probably be eager to show off how strong he is by bullying American athletes protesting injustice.